WR Michael Crabtree caught a touchdown pass from QB Derek Carr midway through the first quarter to open the scoring. Los Angeles would respond with a HB Melvin Gordon rushing touchdown on fourth-and-goal from the one-yard line, but the Raiders would get a field goal to go into halftime up 3 points. Gordon would find the endzone again, this time on the receiving end of a touchdown pass from QB Philip Rivers, but the Raiders would respond with a WR Cordarrelle Patterson 47-yard rushing score. However the Chargers would ultimately win the game 17-16 after Nick Novak kicked the game winning field goal as time expired. With that, we give you our PFF exclusive takeaways from the contest for each team. Rivers looked like classic Rivers in this one, playing relatively mistake-free football while connecting with seven different receivers. When he was given a clean pocket, he completed 18-of-23 passes for 190 yards and a touchdown, giving him a 115.6 passer rating when he threw without pressure. When the Raiders tried to dial up pressure with a blitz Rivers made them pay, completing seven of eight passes for 74 yards and a 105.2 passer rating. 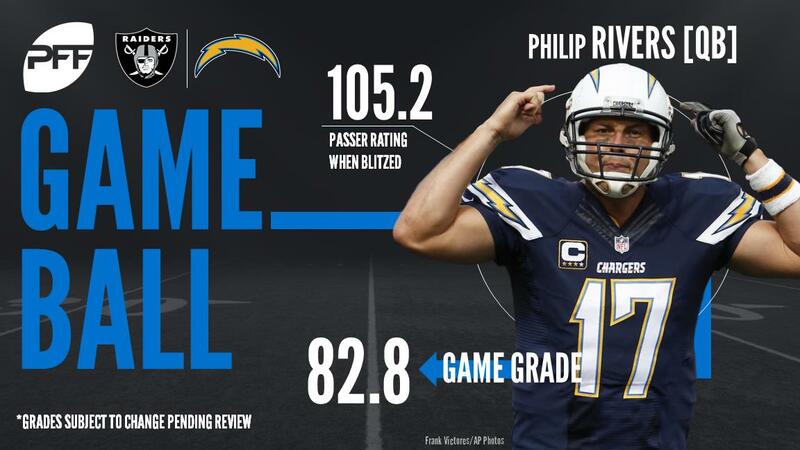 Henry hauled in five of seven targets with 48 of his 90 yards coming after the catch, QB Philip Rivers had a 113.7 passer rating when targeting his tight end on the afternoon. In addition to his effectiveness as a receiver, Henry had a fine day run blocking, earning an 83.4 run-blocking grade to lead the Chargers offense. Addae was part of the Chargers great effort against the Raiders passing offense that only had 152 yards through the air on Sunday. In 29 snaps in coverage, Addae was targeted five times only allowing two receptions for nine yards and had a pass defense. Addae finished with a coverage grade of 89.2. Carrie saw five targets into his coverage on the afternoon and allowed just three catches for a total of nine yards, with the longest going for just four yards; Keenan Allen caught just one of two targets for three yards when matched up against Carrie. The former seventh-round pick out of Ohio tallied one pass breakup on the day to go with four stops. He only played in 10 snaps, but Calhoun found quick success as a pass-rusher during his regular season debut. The 75th-overall pick out of Michigan State tallied two pressures (both coming early in the fourth quarter) on just six pass-rush attempts, beating Russell Okung and Michael Schofield each one time.